Is a weak/any franchise law better than no franchise law? Why I believe this goes back a little ways. 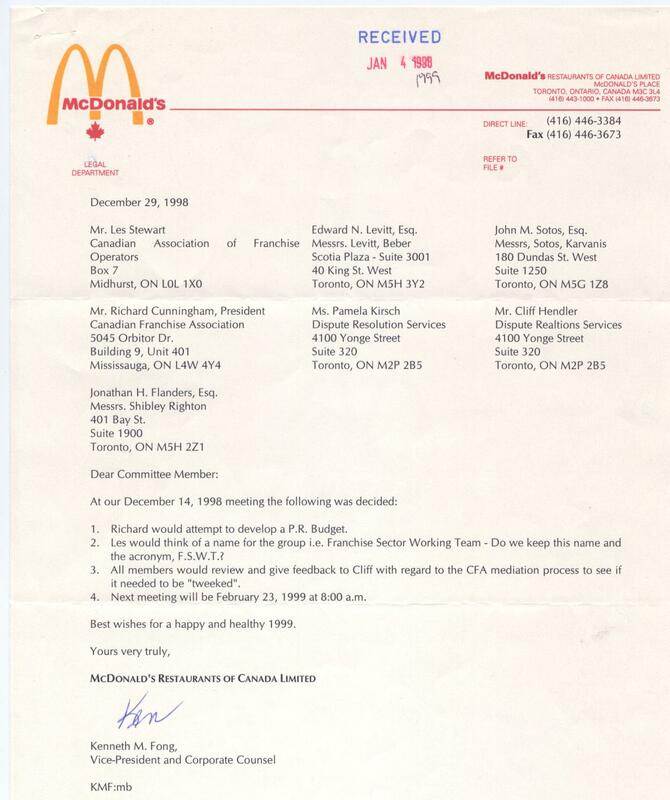 No Law: In 1998, Mr. Ken Fong, McDonald’s Canada, VP and Corporate Counsel formed an industry committee together to discuss ways and means to have industry disputes heard in other than the Courts. I attended as the founder and president of the Canadian Alliance of Franchise Operators, CAFO the 1st and only national franchisee advocacy group. In Feb 1999, I was vigorously questioned by a couple of the 2nd Tier attorneys on the committee about my unwillingness to accept a “disclosure-only” law solution. The industry wanted a law to give an impression of order and oversight in what was seen as the “wild west of the business world”. They wanted what I subsequently defined as a McLaw: toothless legislation designed to protect the dominant parties. CAFO/Les was not welcomed at the meeting. I quickly showed the work we had done on the corporate Identification of a proposed industry dispute resolution process, thanked Mr. Fong and shook his hand, and left the meeting. McLaw passed: In June 2000, I sat with some other franchisees in the opposition guest gallery at the Ontario legislative assembly and watched the Canadian Franchise Association get the law they wanted: Arthur Wishart Act (Franchise Law), 2000. However, the Ontario judiciary are not easily intimidated, black-balled or threatened. Judge-made law: Provincial court justices are smart, independent-minded (no elections) and not easily fooled. Since 2000, they have tended to assume that the Wishart Act was passed as a sincere piece of legislation and that its intent was to protect franchisees. I listened to Chief Justice Winkler last year at the Ontario Bar Association’ Franchise Law Conference in Toronto and he was just great! He told the +100 attorneys that every justice knows the “deal” about franchising because they have all had franchisee clients before being called to the bench. One of the two attorneys at side seemed a little ill-at-ease. I can hardly wait for Thursday to see what Ms. Debi M. Sutin (Gowling Lafleur Henderson LLP) and Ian N. Roher (Teplitsky, Colson LLP) as co-chairs will be presenting. Record attendance again in 2010, I bet.